Vaughn Climenhaga, assistant professor of mathematics, studies non-uniform hyperbolicity.In recognition of these accomplishments, Climenhaga has been awarded the College of Natural Sciences and Mathematics’ Junior Faculty Award for Excellence in Research. This award, which was introduced in 2015, is given every year to a faculty member at the assistant professor level in recognition of their exceptional research contributions. Selection for this award requires nomination, with only one allowed per department. In support of this nomination, three respected researchers, who work within the field but are unaffiliated with UH, are asked to write letters of recommendation, along with the head of the department. For this honor, Climenhaga will be presented with a plaque and an award of $5,000. 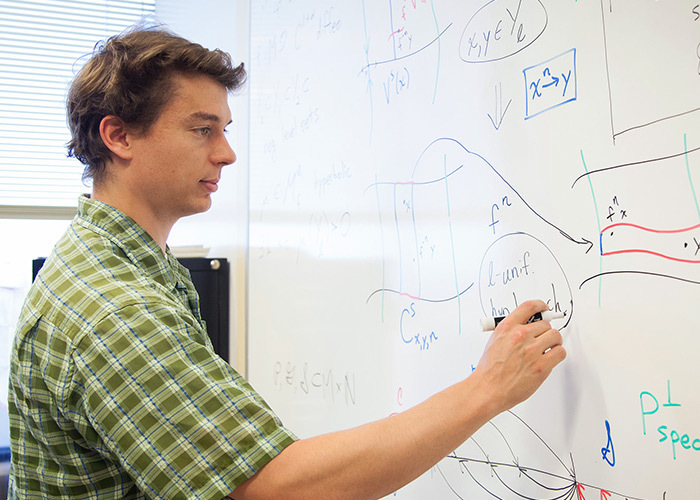 Climenhaga’s research, for which he was awarded an NSF CAREER Award, is focused on understanding dynamical systems that exhibit non-uniform hyperbolicity. “Hyperbolicity is the phenomenon of small changes in starting conditions getting blown up very quickly, leading to significantly different outcomes and unpredictable results,” said Climenhaga, who joined UH as an assistant professor in 2012. With non-uniform hyperbolicity, there will be periods of predictability, and then sudden moments where the different states of the system separate very quickly, going from predictable to random,” Climenhaga said. An example of non-uniform hyperbolicity would be throwing a pair of dice. When these dice are flying through the air, they behave in a way that is predictable and not too sensitive to small changes in the initial conditions. When these dice land, there will be a moment of time when a very tiny change, such as the angle at which they land, will have a significant impact on the final outcome, generating randomness. Climenhaga’s research focuses on adapting mathematical techniques used to describe uniformly hyperbolic systems for use in non-uniformly hyperbolic systems.